Today I became interested in the story of the Arthur Stanley Eddington the British astrophysicist. Not because of his decorated career as a scientist, or of his early validation of Albert Einstein’s theory of light bending as it passes a star, but because of his efforts to make an extraordinary image. 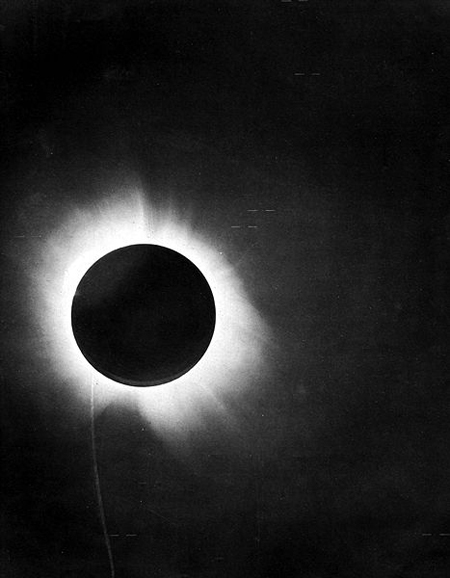 In 1919 Eddington traveled from England to the island of Principe off the west coast of Africa to photograph an eclipse. He packed his huge view camera, all of his darkroom to process the large negatives, scientific equipment to evaluate his findings, and all of his tents and camping gear, it was quite a large haul for 1919. The first part of the journey was by steamship and lasted 6 weeks. Then because of returning troops from the ending of WW I Eddington got stuck in Madeira for another 3 weeks before the could finish the last leg through the jungle to his chosen location. He arrived with enough days to set up all of his equipment, as the eclipse was to begin at 2:00 in the afternoon on May 29th. Fortunately for Eddington the heavens were on his side. The part that struck me was, that after all of Eddington’s efforts, after all the planning and travel and anticipation and rehearsal and the rain. Arthur Eddinginton says he carried out his photographs in faith. I know many things can go wrong while shooting, I go through great efforts to keep those things to a minimum. Those of us who have used film especially know all to well about faith and picture taking. Whether we knew it or not, when we used film we too were carrying out our photographs in faith. I have thought for some time how digital has taken the faith and the magic out of photography. And after reading through Eddingtons story, I am reminded that digital photography is chipping away at the method as well. Digital photography has changed the way I shoot. I know that now I shoot way too many frames because of the ease of it. Where I used to slow down and consider, I find myself snapping and snapping. I have lost the commitment to each exposure, and I am too concerned with immediacy. In the end something is lost and I fear that my images have lost some of their beauty. Take a look at one of Eddingtons images, it is amazingly beautiful.